Paul Foeckler (left) is one of the three Mendeley founders, together with Dr. Victor Henning (middle) and Jan Reichelt (right). He was mainly working on product, tech, and delivery related aspects of the business. 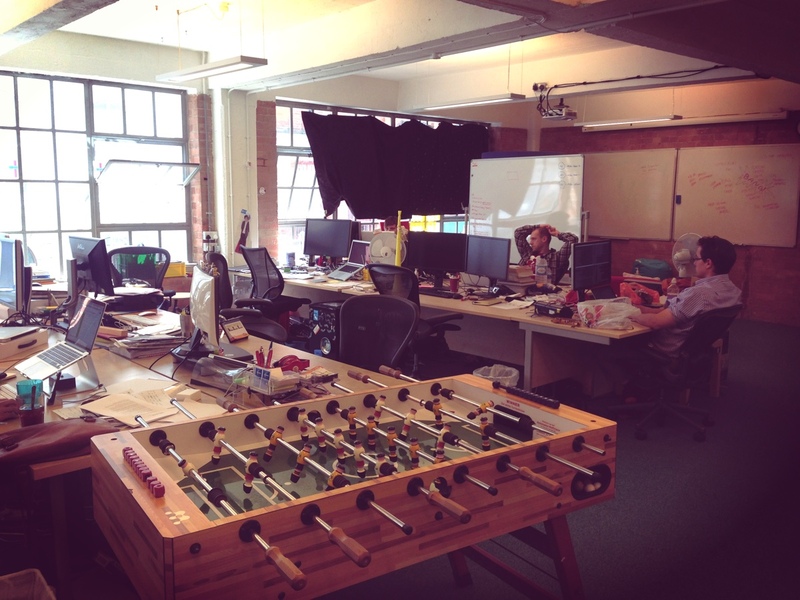 The three co-founders won the Best Startup Founder award at The Europas in January 2013. The company was acquired by Reed Elsevier shortly after. Mendeley is a desktop, mobile and web platform for managing and sharing research papers, used by a large number of the scientific community. Paul took an hour out of his busy schedule to sit down with Doctorpreneurs and share his experiences and advice for any budding entrepreneurs. Read the interview below! So let’s start talking about your background. What did you study at university? I studied a mix of computer science and business back in Germany and I think this course was ideal either for people going into research, thinking of doing a PhD and having an academic career, or people doing their own thing, like becoming entrepreneurs. The course was mainly computer science but you also got introduced to marketing, business, a bit of everything. So you couldn’t do anything properly, but you could do a bit of everything, and that’s a very good skill set for someone starting their own business. When did you think that starting a company was what you wanted to do? Always, I always wanted to be self-employed and do my own thing. I didn’t know what, but I always wanted to do my own thing. 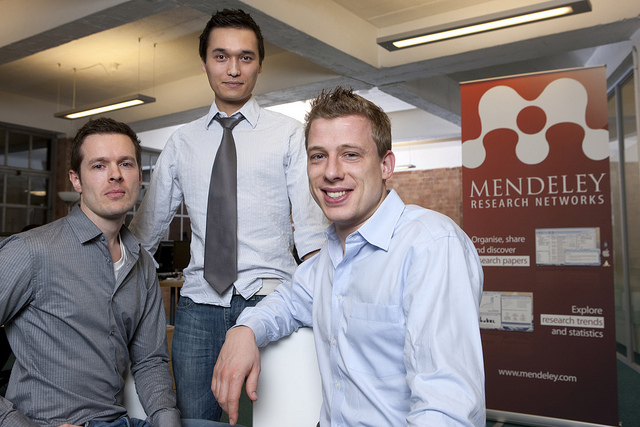 How did you and your co-founders come up with the idea of starting Mendeley? It came out from our own problems. I was publishing while studying, and my co-founders were doing their PhDs and we were all thinking that it’s amazing how old and inefficient the whole research market is. The tools available for reference management and everything else were very bad and we thought that we can do it better. Where did the name Mendeley come from? We spent weeks, if not months thinking about a name. We wanted to have something generic because we didn’t know if we would end up doing what we were doing or just pivot off the idea. Then we had the idea of combining two researchers’ names: Mendeleev and Grigor Mendel and that’s how we came up with “Mendeley”. All the .com and other domains were free and this is how it was born. It sounds nice and can easily be used in sentences. Did you have to turn down other opportunities that you had at the time, in order to focus on Mendeley? My co-founders were doing their PhDs and they had offers in the industry. I was a self-employed web developer working on different projects at the time, and I probably had the chance to become a partner at the company I used to work with. But I knew from the start that working with Jan and Victor, my co-founders, would make a great team because we complement each other very well and I always thought that whatever we do, we would do something good. And that’s why there wasn’t really a question about which way to go. I met them at university. I met Victor at the university I was studying at (BUW Bauhaus University Weimar), before Victor came to BUW, he was studying at WHU Business School in Vallendar/Koblenz together with Jan. And I met Jan through Victor. That’s always the most difficult part, finding the right co-founders. Was it difficult to get other people on board? E.g. investors and other staff? First we self-financed the first prototype, then we took on outside investment from Stefan Glänzer, who is a successful business angel both in the UK and Germany. He liked the team and the idea, so he decided to fund us. Stefan has a very good track record, and with him on-board, it was easier to get follow-up investment. He introduced us to a lot of people which was extremely helpful. When you contacted him, did you have a prototype ready or was this before? Yes, we had a prototype, a very rough prototype and a business plan, but it was very early stages. Did you make the first prototype yourself? No, we outsourced it to a team in Belarus. We spent about £20,000 on the prototype, but it was more like alpha stage before we contacted Stefan. It was quite big for a prototype already though. The Mendeley darts and travel pictures wall! And what’s your primary role in the company right now? Right now, my role is at the intersection between Elsevier and Mendeley. I am overseeing a lot of the integration projects, the publisher relationships from a Mendeley perspective and new strategic projects within Elsevier and Mendeley. I’m also involved in compliance, legal and analytics. How popular is Mendeley at the moment? We have about 3.5m registered users with a growing base of highly active users. In terms of the business model, most users are familiar with the free features, but you have a premium version as well. What can you tell me about how your business model makes it a profitable company? Yes, that’s right – we are running a freemium model, which consists of individual, groups and institutional packages. A lot of big institutions like Stanford, Harvard, MIT bought Mendeley’s Institutional Edition (MIE), but we weren’t profitable. Now having Elsevier onboard we are still in the investment stage and focusing more on the expansion rather than profits. Was the freemium model obvious from the start? No, it wasn’t. We always thought that we would grow the company, grow the user base and then there will be ways to monetise it. Freemium was one route to go down, and there are other opportunities to monetise later down the road. In terms of plans for the future, what are your main aims? We are investing in our mobile capabilities and into ‘social’. The latter is a buzz word but it’s important to improve our user profiles and engagement within the network. We also want to further improve our workflow tools, as well as some other really exciting new projects, which I can’t really talk about right now. In terms of yourself, where do you see yourself in 5 years time? In 5 years time? I don’t know to be honest. I guess at some point I will get hunger for starting a new start-up, but when that is, I don’t know. I am motivated and excited to be with Mendeley and Elsevier right now. It’s great to have Elsevier as our backer, as we now have the biggest publisher onboard. If they understand what is happening in the industry, we have a much better opportunity to convince others to follow the lead of Elsevier, and I think that the Elsevier management is doing a great job pushing what’s important which is helping us to execute on the right things. So Mendeley is about 6-7 years old, reflecting back on the past, what would you say is the most valuable lesson you’ve learnt? A lot of lessons! When you first start, you think that it can’t be that hard. You think that we’re all smart guys, and although that’s true, I think being determined and motivated is one thing, but knowing what’s important and having experience with starting up a company is vital. For example, things like hiring people, building a team, what makes a team and the importance of analytics is hard to learn without experience. The most valuable lesson, and a skill which develops with time, is not letting anything get to you, but saying to yourself “Ok, this is happening, that’s fine, we’ll find a solution for it and we’ll move on”. Not freaking out when something happens, but staying calm and on-course is very important. What was also very important and people don’t teach at university is that in order to be successful you must support and trust your co-founders 100%. We are the core of the company and always stuck together and trusted each other completely. It is natural to make mistakes and when it happens, you must be open about it and resolve it the best way possible without driving your own agenda but do what’s best for the company. You must be able to trust your whole team, but it’s especially important to have a core team which you can fully rely on. Can you recall anything you would have done differently? A lot of things. You make mistakes. Opening up the New York office was too early, hiring some people was too early and hiring others was too late. There are a lot of mistakes and lessons learnt but when you are reflecting on it, you see that you’ve made so many mistakes and you still made it a success. Even if this wouldn’t have been a success, with the experience that you’ve gathered over the past 6 years, you have a much better chance to making your next start up a success in less time. Beyond working, there are also other opportunities to have fun at the office! What’s the most important advice you would give to anyone starting your own company? Just do it! Because of what I just said. Whatever you do, you learn, right? And there’s nothing wrong in trying. Trying to find the right co-founders can be hard, I think it’s not great to do a start up on your own as a sole founder because you don’t have the people to lean on if things are bad, and even to celebrate with when things are great. So, have a team of at least 2, and I think 3 is even better. When you are hiring, be really strict about finding the right people and don’t hire people because you need someone now and he will be “ok”. Do you have a role model in the world of business? He is not really my role model, but I like a lot of things that Steve Jobs has done, and how he worked. I guess he’s a role model for a lot of people. He’s done a lot of things well but he also had a lot of flaws. Why do you think most new start-ups end up failing in the first year? I think most people don’t take their startup serious enough. They may start and as soon as they hit a couple of roadblocks they say “Our idea wasn’t good enough” or some other excuse. That is why you need to be really determined and push through all the barriers in your way. It can be compared to having a very big round rock that you need to roll down the street. Pushing it and getting it moving at the beginning is very hard, but once it starts rolling, it gets easier and easier and once it has caught some speed, its really easy. The first period is always the hardest. We had very long hours every night and a lot of people telling us that the idea was bad, so you need a lot of self-motivation and confidence. Did you have any doubts about Mendeley when you first started? Yes of course, all 3 of us had doubts, but that’s the thing. When one of us had doubts, the other two could build him up again so we supported ourselves this way. But yes, there was always a danger of Google moving into the same space building on Google Scholar. Thank you for the interview. Is there anything else you would like to add for someone who is looking to make the switch from medicine to starting their own business? Before you invest lots of time and money into a startup, you should try to build a mock up, a very rough prototype of your idea, put it in front of people and see how they react . Don’t wait until you have built the perfect product that you’ve envisioned. You need to have an MVP (minimally viable product) that you can put in front of people to evaluate and iterate on your idea. The sooner you do this small scale testing the better.